Admiring broad vistas of nature while hiking along a trail is an exhilarating experience. The only drawback is that it isn’t very time-efficient. Even an experienced hiker in good physical condition can only cover a few miles in a day, which limits the amount of natural beauty one can see. That’s why I invented the car hike. It’s in the road-trip family, but a car hike takes you off the main highways and onto the scenic byways. It allows you the opportunity to travel much greater distances than a traditional foot-hiker can attain, thereby revealing far more scenic beauty. To get the additional thrill of “roughing it” that hikers enjoy, I recommend turning off the car’s air conditioning and rolling down the windows. Sally took the wheel after lunch and we found a road off the main highway — it’s called Firehole Lake Drive. Along the way we saw some cars parked and decided to investigate. It was the site of a geyser called White Dome. Several people had been waiting there quite a while, but within minutes of our arrival it erupted — a pretty impressive show, too. It wasn’t as high as Old Faithful, but the eruption seemed to last longer, and the cone was taller. While looking for the perfect spot to have the “refreshments” I had in the trunk of our rental car, we came across a frustrated romance. 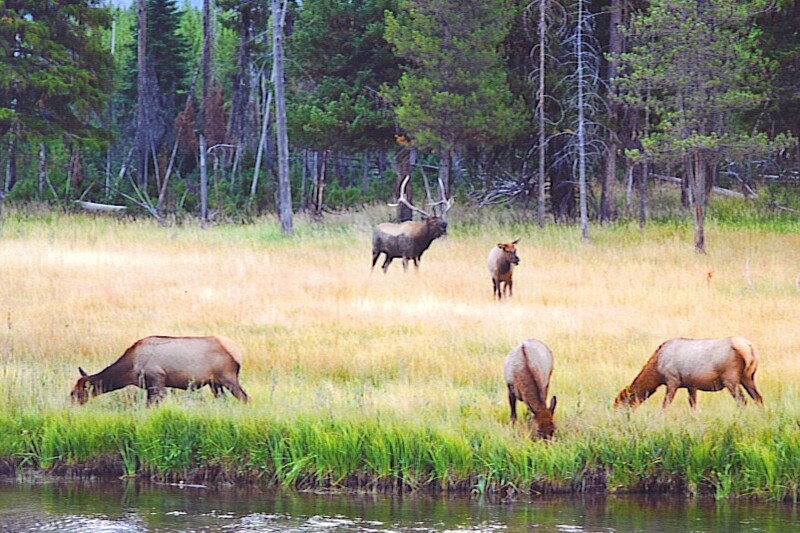 A male elk with extravagant antlers was in the company of seven females. His bellows — and aggressive passes — made it clear that he was strongly interested in mating. The females all claimed to have headaches, though, and managed to thwart his advances. This entry was posted in Travel and tagged Yellowstone. Bookmark the permalink. It also comes equipped with a cup holder for your bud light.